Mortar fire on Eshkol region causes serious injury. Report of serious injury in Ashdod was wrong. 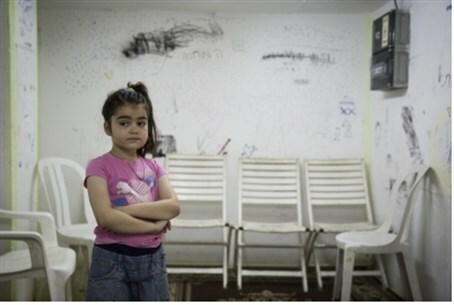 Child in a bomb shelter, Ashkelon. There are conflicting reports regarding injuries following a heavy barrage of missile fire at Israel from Gaza Thursday evening. At least one person suffered moderate or serious wounds in the Eshkol region of the Negev. According to Ynet, the person was wounded by mortar fire from Gaza. Another person was reportedly lightly wounded. The regional council said that the two are not residents of the region, and Ynet said that they are soldiers. Earlier, a missile fired from Gaza struck in Be'er Sheva, near a sport hall, causing light injuries, according to Channel 2. Another missile directly hit a home in the Negev, said Magen David Adom. Channel 2 said that the residents of the home that received a direct hit ran to the protected space in time and thus avoided injury. Be'er Sheva Mayor Rubik Danilovich said that seven or eight salvos of rockets were fired at the city. He urged residents not to trust Iron Dome to keep them safe, and not to tape video of incoming missiles and Iron Dome interceptors. Ynet said that 20 rockets were fired at Be'er Sheva. Sirens wailed in Tel Aviv, Rishon Letzion and Nes Tziona at about 7:45 p.m. and live television appeared to show two successful interceptions. Reports later said that six missiles were intercepted over Tel Aviv. Analysts on Channel 2 said that Hamas is trying to find a weakness in the IDF's missile defenses by firing a large number of short range missiles at southern Israel, while also firing some longer range rockets at central Israel. The sirens alerting Israelis to incoming rockets also sounded early Thursday evening in Jerusalem, Beit Shemesh, Maaleh Adumim, Binyamin and Samaria regions. Iron Dome rockets intercepted two missiles over Jerusalem, out of a total of four that were fired at it. No one was directly hurt, but a 74-year-old man in Kfar Adumim suffered a serious head injury as he ran to the bomb shelter. He was taken to Hadassah Hospital where he is under anesthesia, and being artificially respirated. "Four rockets were fired at Jerusalem, of which two landed in open areas and two were intercepted," an army spokesman told AFP, without giving further details. Witnesses and Palestinian security sources told AFP one rocket struck near Maaleh Adumim, while a second hit close to an Israeli military prison near Ramallah. Three loud blasts could be heard around the city shortly after sirens wailed, sending people scrambling for shelter, AFP correspondents said. Sirens also sounded across Maaleh Adumim, and an explosion was heard in Ramallah, witnesses and a correspondent said. Witnesses told AFP one struck an open area in Mishor Adumim, an Israeli industrial area adjacent to Maaleh Adumim, east of Jerusalem. In addition, a heavy salvo of rockets was fired at southern Israel, and a direct hit was scored on a home in the Shaar Hanegev region. No one was hurt. Earlier in the afternoon, terrorists launched yet another heavy barrage of rockets at Israeli cities in the center of the country. Sirens were heard in Ramle, Lod, Nes Tziyona, Yavne, and other areas south of Rishon Lezion. Several of the missiles were destroyed in mid-air by the Iron Dome anti-missile defense system, while others fell in open areas. No injuries or damage were reported. The rockets at the central plain cities were a continuation of the heavy barrage that Israel faced on Thursday, the third day of Operation Protective Edge. Six missiles were fired at Tel Aviv Thursday, with a barrage of four missiles fired at about 8 AM, as tens of thousands of commuters were driving into the Tel Aviv area. Two more missiles were fired at about 11:30 AM. All six were shot down by Iron Dome missiles. No damage to any buildings was reported, although several cars were said to have been struck by shrapnel. One woman was treated for shock in Ramat Gan, Magen David Adom officials said. On both occasions, warning sirens were heard in Tel Aviv, Ramat Gan, Bnei Brak, Holon, and Bat Yam. Hamas took responsibility for at least four of the rockets, with Islamic Jihad terrorists firing the other two.